Optical spectroscopic techniques, such as UV-VIS-NIR and Raman, allow for the atline and inline, real-time analysis of multiple parameters for quality control. These optical process sensors have been used for concentration measurements in various applications and are easily adapted to different sampling methods including fiber-optic immersion probes, reflection probes and flow-through cells. In UV-VIS-NIR spectroscopy, the sample is illuminated by a continuous, white light source, and the transmitted or reflected light measured, allowing the determination of the absorbance of the light as a function of wavelength. The absorption depends on the electronic and atomic structure of the absorbing molecule. The Lambert-Beer law relates the absorption of light to the concentration of the absorbing species. In Raman spectroscopy, the sample is illuminated using a single-wavelength laser source. The energy of the inelastic scatter, Raman scattering, differs from the input wavelength by discrete amounts, which depends on the vibrational frequencies of the sample. The Raman signal directly correlates with the concentration of the measured molecule. The control of fractionation processes in chromatography plants often requires a wide variety of spectral information from the target products. Mainly photometric systems have been used so far. Often, only the measurement of a narrow absorption range is not sufficient enough. Moreover, depending on the product and especially in batch process operation, a multitude of absorption bands has to be evaluated for the complete UV-VIS-NIR range. The tec5 CompactSpec® EMB embedded spectrometer can measure several absorption bands simultaneously over a wide spectral range and determines process-relevant results. A single system replaces the corresponding number of photometric systems, which considerably reduces the acquisition and maintenance costs for process analysis technology [PAT]. Furthermore, the CompactSpec® EMB also opens up areas in the UV [up to approx. 190 nm] which are not accessible by commercially available photometric systems [typ. starting from 254 nm]. The CompactSpec® EMB does not require a PC, which also reduces IT support costs. By embedding the complete processing and evaluation functions in the included tecSaaS®device unit, measurement results [e.g. several absorption values] can now be transferred directly to the process control system [via Modbus TCP, 4-20 mA analog interface, and many more]. One of the top 10 pharmaceutical companies is now also using the CompactSpec® EMB for the production of proteins and enzymes in its biotechnology sector. This smart multi-sensor combines the production-specific requirements in one compact device. It enables a reliable control of the chromatography system and is failure-free for over a long period of time. The flexibility and adaptability of the system configuration and the concept of the smart embedded sensor tecSaaS® [Spectrometer as a Sensor] without additional PC convinced the customer. For the customized system, a broadband MMS UV-VIS SB spectral sensor [measuring range 195 - 720 nm] is used in combination with a xenon mini flash lamp. A fibre-coupled flow cell meets the process requirements of the products to be measured. As optical material in contact with the medium, thin sapphire glass is resistant to regular cleaning processes with sodium hydroxide solution. In combination with quartz collimation optics, even a spectral range below 215 nm can be measured. From the low UV range to the VIS range, for example, four characteristic absorption ranges are integrated, and the obtained values are transmitted to the process control system via an analogue interface. In addition, due to the adjustable optical path length [OPL], the measuring cell can be easily adapted to various product streams originating from fraction processes of the chromatography plant. A very satisfied customer who does not have to worry about his process analysis technology and who already plans the integration of further systems for his plants. What more could you ask for? 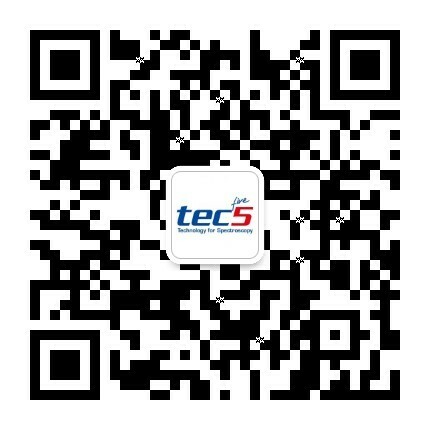 Outstanding customer satisfaction is the result of this project, from which further plant designs including tec5 spectrometer systems will emerge. The customer is a specialized company in the instrumental analytic business. Sepiatec develops separation systems based on HPLC and SFC technology, enabling their customers to speed up their separation and method development. The systems of Sepiatec are used around the world by major pharmaceutical and biotechnology companies as well as by research institutes. The new HPLC detector design is capable of measuring 8 channels in parallel, using the tec5 electronic multiplexer MUX-8A in combination with the Carl Zeiss MMS monolithic spectrometers, which proved suitable for the application. The first generation of instruments was equipped with a mechanical fiber-optic multiplexer. All measurements were done sequentially. The parallel operation of 8 MMS spectrometers now optimizes speed and signal-to-noise ratio significantly, which brings Sepiatec a big advantage in the market.